In Records Were Made to Be Broken, we provided our outlook that the bull market run and US economic expansion would likely continue, perhaps even to win the Olympic gold medal for longest ever in length. In today's piece, we provide our view on three key themes in the current market environment and how these relate to our late-cycle investing game plan. Investors have been spoiled over the last two years with record low levels of volatility in virtually every asset class, causing some investors entering 2018 to throw caution to the wind as euphoric levels of greed crept into the market. The title to our quarterly newsletter was "Records Were Made to Be Broken" and the recent market decline has ended some of those records already. Using S&P 500 data going back to the Great Depression, the US stock market set a new record of going 311 days without a 3% decline and 404 days without a 5% decline. We are unlikely to repeat these feats any time soon as we believe investors should anticipate a more volatile environment going forward as we transition through a major turning point in global monetary policy. In the aftermath of the Great Recession of 2007-2009, we saw central banks respond with unprecedented stimulus using zero-interest-rate-policy (ZIRP) and quantitative easing (QE) to expand their balance sheets to unimaginable levels. The collective result of these actions was an end to the Great Recession and the beginning of new liquidity-fueled economic expansions and bull markets around the world. The global liquidity tide of easy money began to slow down first with the US Fed ending its QE program in 2014, eventually raising interest rates in 2015 for the first time since 2006. Along with a steady increase in rates, the Fed is also on track to shrink its balance sheet to the tune of an estimated $420 billion this year and $600 billion next year. Though President Trump has enacted a stimulative tax cut, as Dave Rosenberg recently pointed out (Lunch with Dave, 12/28/17), estimates project $140 billion in stimulus for economy-wide earnings this year with additional gains of $80 billion next year—a small offset to the liquidity drain from monetary policy. 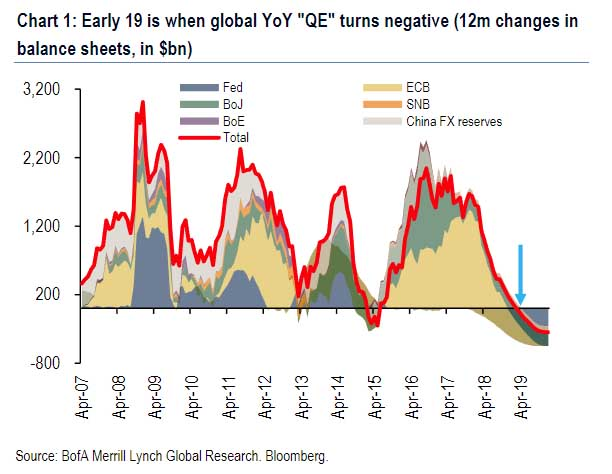 Further adding to the monetary liquidity drain will be the European Central Bank (ECB), which is slated to end its QE program later this year. 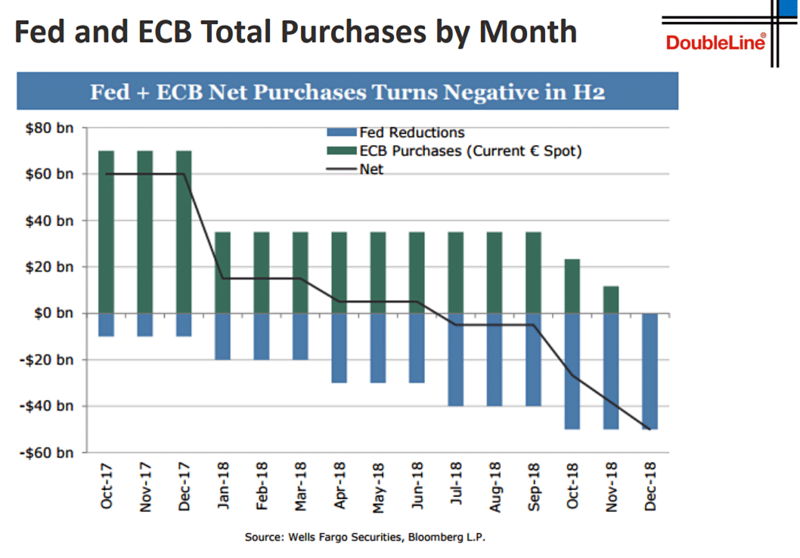 According to Wells Fargo, the combined purchases of the world’s two biggest central banks—the Fed and ECB—will turn negative beginning this summer and only accelerate in the second half of the year. Furthermore, when we look at the annual growth rate of the top seven central banks' balance sheets, we see that it will likely turn negative in 2019 for the first time since 2015. If you can recall, 2015 into 2016 was a very tumultuous period with back-to-back double digit declines and fears over a major market top in the works. For the better part of the last decade stock prices and central bank balance sheets have been joined at the hip so anything to upset the apple cart should not be dismissed. As the global liquidity tide starts to go out over the next year, we are likely to see who has been swimming naked (as Warren Buffett famously remarked). This should also add to further volatility, a common characteristic seen in the later stages of the business cycle. In addition to our expectation for an increase in volatility over the coming year, another theme we are watching is for a pick-up in inflation, a similar late-stage business cycle characteristic. Over the last year and a half, we have seen a significant pick-up in the manufacturing sector, which acts as a long-leading economic indicator for future trends in inflation. Over the last decade we have seen two cyclical upturns in inflation, the first occurring in 2010/2011 and the second in 2014, and the upturn in manufacturing activity seen over the last two years tells us to expect our third upturn in inflation over the next two years. This is shown below with cyclical upturns in the Core Consumer Price Index (CPI), which excludes food and energy, highlighted by the blue arrows and manufacturing activity shown by the black line. In addition to rising economic activity, a tight labor market also pushes inflation higher via wages. Small businesses are the heart and soul of job creation in the US, and one of the most glaring trends for small businesses is the difficulty finding qualified applicants for job openings. 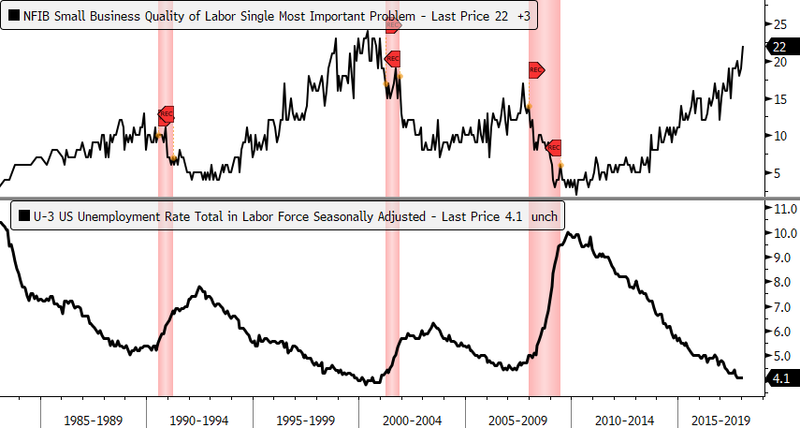 In the most recent NFIB survey, over one in five small businesses reported that poor labor quality is their single most important problem, something we haven't seen in almost two decades (top panel below). With continued economic activity and a diminishing supply of labor, this puts upward pressure on wages as pre-existing employees demand higher compensation in response. Notice, as well, that poor labor quality wth a falling unemployment rate is a classic late-stage business cycle progression that is witnessed prior to recessions. The last factor we want to highlight that is likely to lead to higher inflation is the weak US Dollar (USD). Weakness in the USD relative to a basket of foreign currencies leads to higher commodity and import prices, which in turn contributes to a higher general level of inflation. Past weakness in the USD suggests we should see the trend of rising inflation persist throughout 2018 as shown below. Twitter Post from Neel Kashkari, current President of the Federal Reserve Bank of Minneapolis, one month prior to the top in Bitcoin. As mentioned previously, an important ingredient for a market top is either high or euphoric levels of sentiment. Consumer confidence plummeted to an all-time low after the 2007-2009 recession and has been steadily making its way back as the economy has grown and asset prices have recovered. 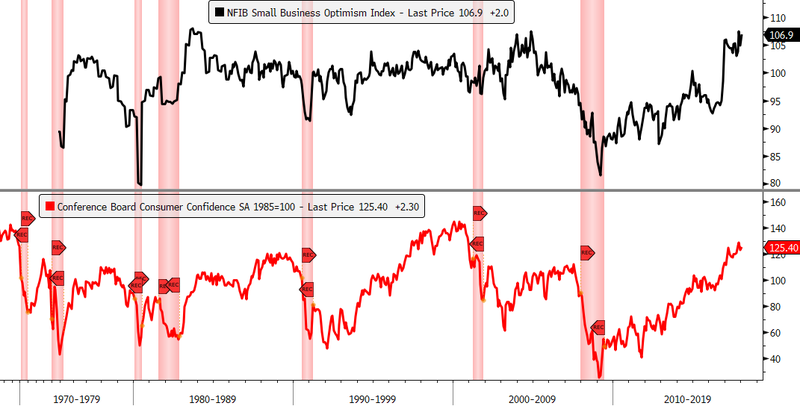 After Trump's election, small business sentiment saw the largest single jump in its history and has continued to climb to the highest reading in decades (top panel below). As well, the Conference Board’s measure of consumer confidence is at 18-year highs and near the upper range of the last half century (red line, lower panel in image below). There are several strategies to help one navigate increasing market risk in the latter phase of the business cycle and we will touch on two of them, with risk management being the most important. As stock valuations become elevated and downside risks pick up, it becomes prudent to start taking chips off the equity table and move into safer assets like cash and bonds, which typically help protect you during equity bear markets. The reason why minimizing large setbacks to your liquid net worth experienced during bear markets is so important is that the return required to breakeven becomes parabolic the deeper the loss. The average bear market decline over the last century has been 45% and so just to breakeven your portfolio would have to appreciate by 82%! Looking at the two figures above, you can clearly see why Warren Buffett’s rule number one and two is, “DON’T LOSE MONEY!” To help mitigate the downside of bear markets, shifting away from riskier investments is a prudent strategy as illustrated nicely by the figure below. The returns for a 40/60 and 60/40 stock & bond portfolio were compared to a 100% stock-only portfolio using the S&P 500 to represent the stock market. Measuring from the October 2007 peak in the market, the safest portfolio (40/60 stocks & bonds) took two years to recover its losses while the next safest portfolio (60/40 stocks & bonds) took three years. That may seem like a long time, however, it took the S&P 500 (100% stocks) nearly 5 years after the 2007 top to get back to even. As we see, the harder you fall, the more time it takes to get back up again. Source: JPM Guide to the Markets. Past performance is no guarantee of future results. All indexes are unmanaged and cannot be invested into directly. Another thing worth pointing out is that the riskiest portfolio consisting of 100% stocks did not catch up to a 40/60 or 60/40 stock & bond portfolio until late 2014, seven years after the markets peak! 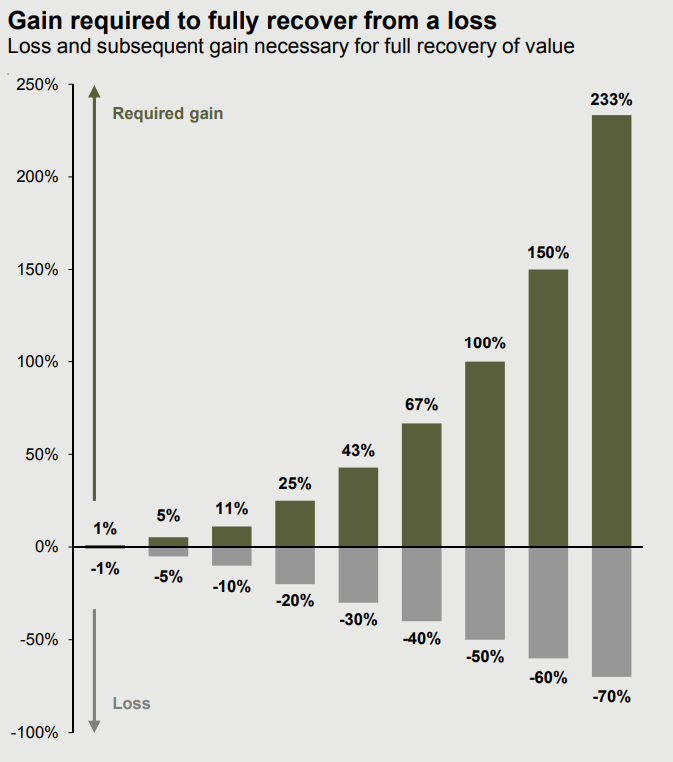 Clearly, reducing risk prior to a bear market can help investors in the long-run. The relative performance of various asset classes is largely dependent on where the economy is within the business cycle. For example, during the early and mid-cycle phases, stocks tend to be the best performing asset class while bonds lag behind. However, when you shift towards late-cycle, the best performing asset class is typically commodities, with the outperformance in stocks starting to diminish relative to junk and investment-grade bonds. Thus, shifting one’s portfolio to inflation-resistant assets such as commodities can be a good hedge against rising inflation, which typically peaks in late-cycle to early recession. Given our belief that inflation will rise in the coming months (theme # 2) and that we are late-cycle, a shift towards assets that act as a hedge against inflation appears warranted. 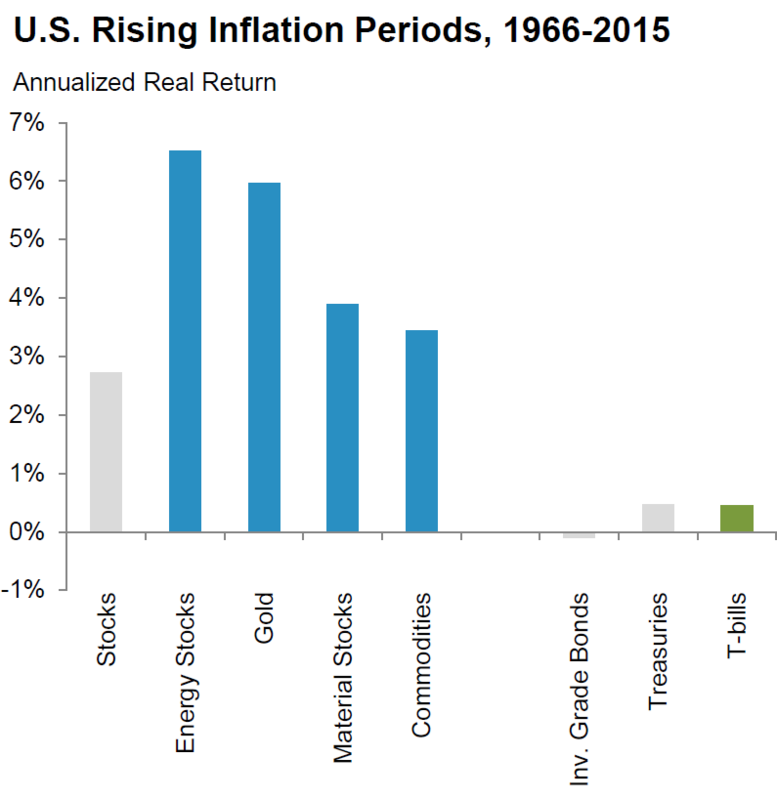 Since 1966, energy stocks have been the best hedge against rising inflation followed by gold and material stocks. Source: Fidelity Investments, Quarterly Market Update (Q2 2017). Past performance is no guarantee of future results. As mentioned above, our concern heading into 2018 was that real interest rates would rise and that has certainly been the case. However, even with real interest rates now near their 2013 and 2015 highs, this has yet to translate to weakness in the price of gold. The temporary breakdown in gold’s relationship to real interest rates (yellow highlighted region above) suggests that, over the near-term, either gold has it wrong and will fall or real interest rates are likely to fall instead. Until we see resolution, we remain on the sidelines. That said, there is another trend we are closely following that may prove important. For a variety of reasons, currency movements in the Japanese yen have a number of ripple effects on the market and various asset classes, particularly as a leading indicator for gold. The two most recent examples are the yen breakdown in late 2012 BEFORE the large drop in gold in the first half of 2013 (red shaded bar below) and the bottom in the yen in the middle of 2015 followed by gold later that year (green shaded region below). It was the large yen move late 2015 to early 2016 that gave us confidence to buy gold during a bottom and also the sizeable decline in the yen late 2016 that told us the rally was over, leading us to sell gold at a premium. 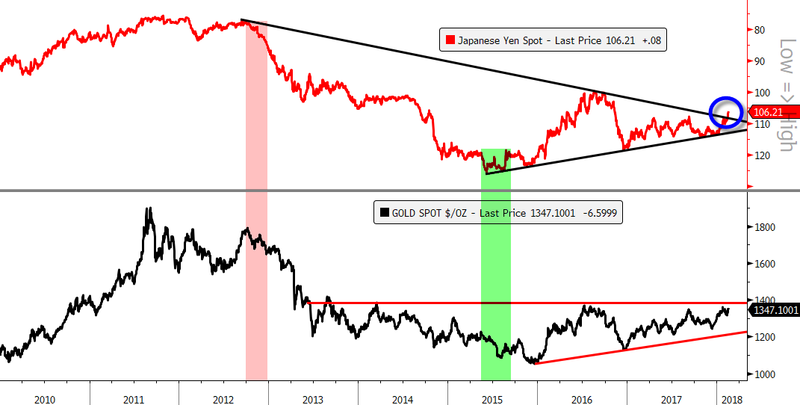 As we were closing out 2017, the yen was precariously close to breaking down its 2015-2017 bullish trend and is a major reason why we turned cautious on gold. However, with the strength in the yen this month, breaking the bearish trend that has been in place since 2012, this suggests that the bear market in gold that began in 2011 may now be over. A move north of $1400 an ounce and a decline in real interest rates would place us firmly in the bullish camp for gold and change our assessment. We believe that the three key themes outlined above—a rise in volatility, inflation, and investor sentiment—are characteristics of a business cycle in its later stages. If we are correct in our view, then implementing late-cycle strategies appears warranted, particularly by shifting away from stocks towards lower volatile assets like cash and bonds while simultaneously positioning accounts towards late-cycle assets like commodities and commodity-related stocks. We are also on alert for a bullish move in gold but are waiting for confirmation based on the information outlined above. The investment stakes are raised in the latter phase of the business cycle for one simple reason: the next stage is potentially recession (see Records Were Made to Be Broken for our recession outlook) and the most devastating bear markets in history have all been associated with economic recessions. As such, we will remain vigilant by watching incoming economic and market data to gauge when we are moving from late-cycle to recession. Given the potential investment risks and rewards for this year and next, now is the time to conduct a thorough risk assessment of your liquid investments. To find out more about Financial Sense Wealth Management or for a complimentary risk assessment of your portfolio, click here to contact us.